I run Ubuntu 12.04 using Gnome as shell. When I updated Tweak to 0.8.0 I started it and this was what I had http://imageshack.us/photo/my-images/812/201210081823541280x800s.png/ Thought it was just a first-run problem and tried again after reboot. Nothing changed. Looking on the Tweak blog someone commented the same thing, even if he uses Lubuntu as distro. Feel free to ask more information, and tell where to get them as I'm not familiar with bug reporting. Hello, could you try Ubuntu Tweak with the default GNOME theme? (ubuntu-tweak:2627): GConf-WARNING **: : You can't use a GConfEngine that has an active GConfClient wrapper object. Use GConfClient API instead. (ubuntu-tweak:2627): Gtk-WARNING **: Failed to set text from markup due to error parsing markup: Errore alla riga 1 carattere 55: È stato chiuso l'elemento "markup", ma l'elemento correntemente aperto è "big"
Could you give me the screenshot after running "ubuntu-tweak -m Theme"? Hmm, there's one more user has the same issue like this. 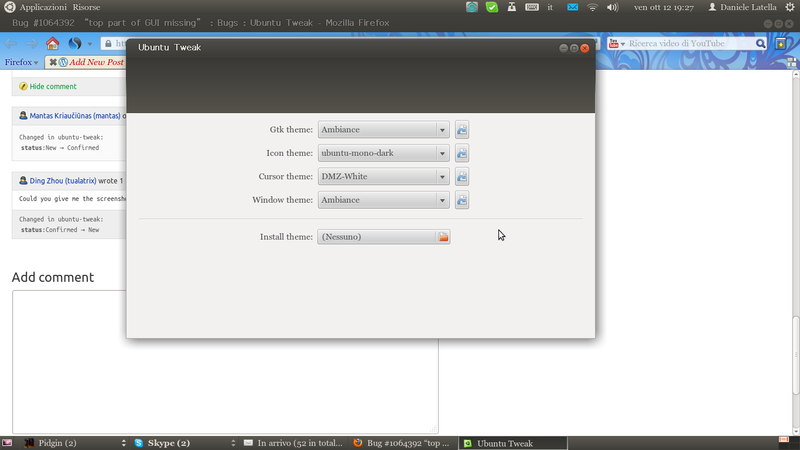 Try only to change the width of the ubuntu-Tweak window and all commands on GUI header will apear! If the window is too narrow to show all commands in the header, no command will appear at all. This is the simple bug of the programm. If this still doesn't work, I will try other way. Yeah, changing width makes the header appear. Is it because words in Italian are longer?